The most beautiful thing about starting a new rogue-like game is seeing the different options that are available to customise your first play-through. Binding Of Isaac shows you the 6 characters you can unlock, Risk of Rain presents the three classes you can play as. Immediately you’re thrown into the game knowing full well that you can choose to play however you want, and that your choices are going to matter, and that’s what makes rogue-likes my favourite genre, because you have such control over your playstyle from the get go. Runers developed by Let’s Get Kraken is no different. Wait, let me rephrase that. Runers is different. You’re not provided with 5 characters, or three classes. No sir. You’re give 20 of each. 20 blessings and 20 classes. Let’s do some maths for a minute. That’s 20 x 20 playable combinations. And while I’m sure the majority of you remember your 6th grade multiplication, I’ll do it for you here. 20 x 2 = 40, and 40 x 10 = 400. That’s right, 400! Class/race combinations. That’s an incredible amount of choice, and you haven’t even started the game yet! if you played through the game 100 times changing only those beginning choices each time, you’ve only played a fourth of the game! I know I’m starting to ramble here, but re-playability is a major thing for me in a rogue-like, and Let’s Get Kraken absolutely nail it from the get go. Choice is essential in rogue-likes I like. Once you get past this selection, you’re offered the choice of ten runes to choose from. Each of these changes the way your character plays. The Spark rune lets you shoot lighting, while the Mind rune shoots a bolt that goes through things. The Earth rune shoots a bolt that pushes back enemies, and the Fire rune one that burns. As you look through these spells, you think to yourself, “Wouldn’t it be awesome if I could combine these to make a spell that shoots lightning AND burns?” And you’re in luck. Combining and modifying, and even experimenting with spells happens to be the main method of upgrading your characters arsenal. 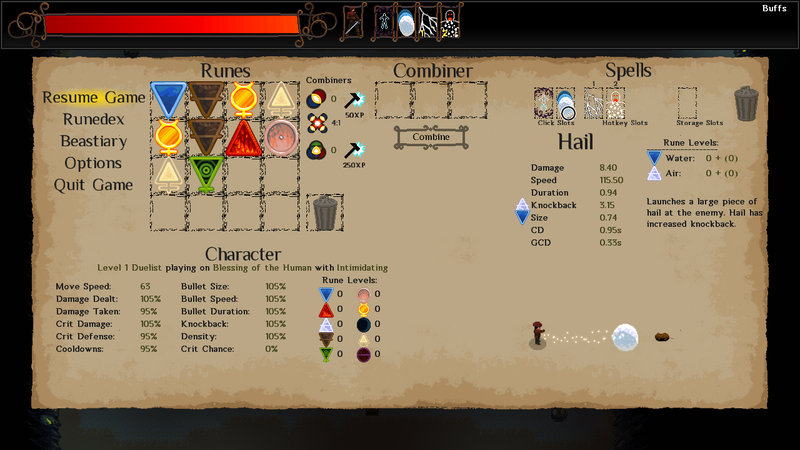 Runes drop as you defeat enemies, from each of the 10 elements that you could pick from at the beginning. These can have bonuses to bullet size or projectile travel speed, and occasionally can be combined with other runes to create more powerful attacks. You need a relatively rare drop called a “combiner” before you can do this, but once you find one the spells you can choose from rise from the 10 runes, to the 65 combinations that you can now make. Every spell is different, and can change your gameplay style totally. 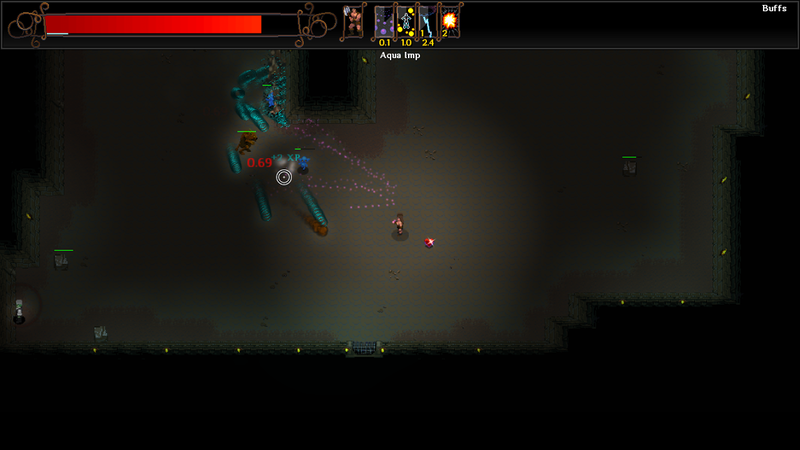 The experimentation of these spells is what I personally think is the most fun part of the game. Once you find one of the even more rare “triple combiners” you can then combine three runes at once, opening up the spell bank even more which modifies what you can do even more. On top of this, your character gains experience through kills, and levels up. Upon leveling, you can choose between four traits to gain, which are randomised and provide a small bonus that makes certain tasks easier. One of my personal favourite traits is one that upon dying allows you to lose all your traits and resurrect yourself. And for those of you that have played rogue-likes, you know how valuable a second life can be, especially when you get further along into the dungeon. Speaking about dungeons, Runers has a pretty nifty map layout. Rooms can contain enemies or challenges, and never both. These challenges can be herding wisps into portals (one that I really don’t enjoy) or having to defeat waves of enemies in a time limit. There are more, but I’ll leave those discoveries to you. Each room also has the chance of having a staircase in it, which takes you down to the next level. Each level has a random enemy buff, making the room harder. 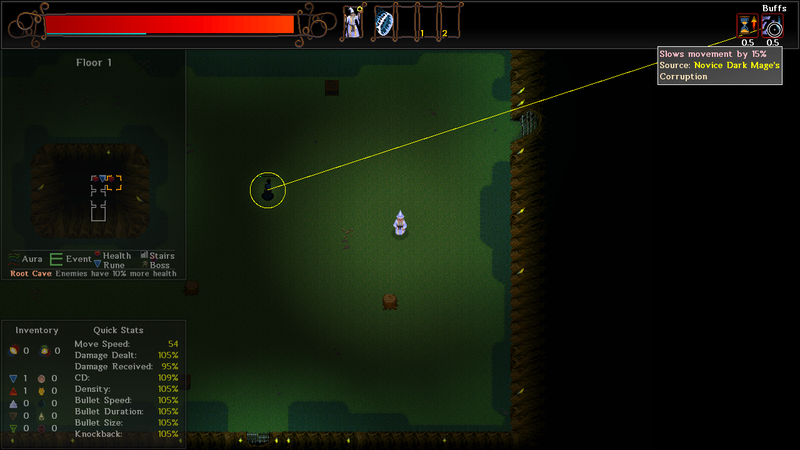 These can be things like a 20% increase of enemy bullet size, or 10% increase of enemy health. Nothing crazily overpowered, but enough to keep you on your toes throughout the whole game. The enemy variety is fantastic, with 140 different enemies being thrown at you as you play. From skeletons that you need to run over after killing, to swarms of rats and cockroaches that keep you on your toes as you sprint away from them. These can also be upgraded into champion level enemies that deal more damage and have more health. The coolest thing about these enemies is that Runers features a Beastiary, where information about the enemies killed is stored. When killing an enemy for the first time, a small pop-up shows in the top left, noting that the enemy’s details have been added to the logs. 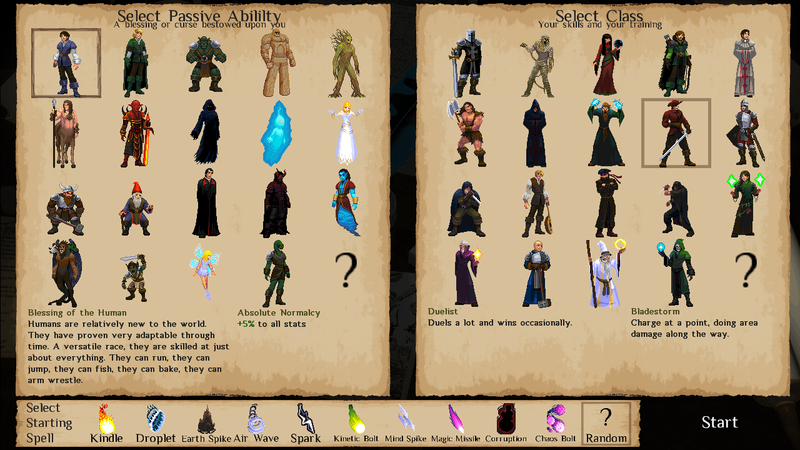 This makes the game feel a lot larger, and allows the players to spend time learning about their opponents, and craft different spells with which to take them done. Boss fights are force to be reckoned with, but I won’t spoil them for you. Look forward to them, I guarantee that they’re a dangerous part of the game, and definitely a trial that stands up to the trope of a boss fight. Artistically, and musically, Runers feels lovingly crafted. The soundtrack (which is also available for purchase on Steam) is light and wonderful, and provides something that adds so much to the atmosphere on the dungeon you’re in. The music flows well, and makes the game world feel much larger than it would otherwise. Runers takes the ideas of the rogue-like genre that have become set in stone, and improves and modifies them to create a masterpiece of rogue-like action. Providing the player with a bevy of choice, and a huge amount of content to discover, fans of the 2D rogue-like action genre owe it to themselves to play Runers. Launching today, you can find Runers on Steam for the modest price of $7.49 for the next week, with the price going up to $9.99 on the 9th.